Charles J. Taylor (1824-1904), a lifelong resident of Great Barrington, had a personal interest in the town's history. He also was a prominent businessman and civic leader who conducted a fifteen-year research odyssey through town archives, memoranda, diaries, old manuscripts, notes, and other documents. In 1882 the town published his research findings in the book History of Great Barrington. Up until his death Taylor continued to update the book. In 1923 the town appropriated funds and commissioned Dr. George Edwin MacLean, Taylor's son-in-law, and Ralph Wainright Pope to write an extension to the book covering the period 1882 to 1922. 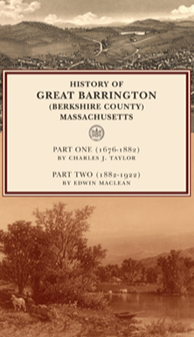 The expanded History of Great Barrington was published in 1928. The book is a comprehensive microhistory of the Berkshire County community as seen through the eyes of an astute businessman. Taylor pays close attention to land development, property ownership, the evolution of business and industry, schools and community organizations. His account does not neglect "big history," either; its chapters on the Revolutionary War period, Shays' Rebellion, and the Civil War detail Great Barrington's involvement in these sweeping historical events. Genealogists, historians, and the general reader will find the book a valuable resource and a fascinating look at the life of a unique New England community.